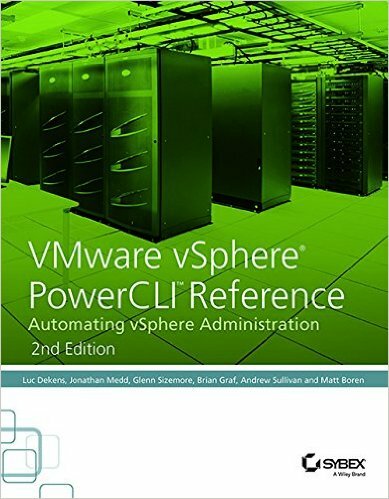 VMware vSphere PowerCLI Reference, Automating vSphere Administration, 2nd Edition is a one-stop solution for vSphere automation. Fully updated to align with the latest vSphere and PowerCLI release, this detailed guide shows you how to get the most out of PowerCLI's handy cmdlets using real-world examples and a practical, task-based approach. You'll learn how to store, access, update, back up and secure massive amounts of data quickly through the power of virtualization automation and you'll get acquainted with PowerCLI as you learn how to automate management, monitoring and life-cycle operations for vSphere. Coverage includes areas like the PowerCLI SDK, SRM, vCOPS, and vCloud Air. Plus guidance toward scheduling and viewing automation, using DevOps methodology and structured testing and source control of your PowerCLI scripts. This book is your complete reference for managing vSphere in a Windows environment, with expert instruction and real–world application. Luc Dekens, VMware vExpert, has worked with operating systems for over 20 years and now focuses on virtualization, particularly platforms produced by VMware.